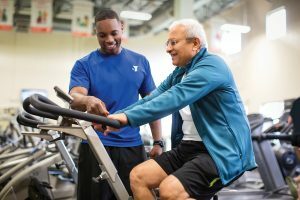 Your membership at the Community YMCA opens doors to many options to develop the vibrant, healthy life you have envisioned. Not sure of where to start with your fitness goals? Maybe you are just unfamiliar with equipment setup. If so, our fitness coaches can help guide you to your specific goals. Classes are 45 minutes. Need help getting motivated, bored with your routine or been exercising with no results? Let our qualified personal trainers design or redesign your program to help you get the most out of your workout. Don’t miss out – this is great for all ages. Meet one-on-one with our nutritionist to discuss the best strategy to meet your fitness goals. Contact Colleen Gutowski Cgutowski@cyedc.org 484-479-3403 at the Ridley YMCA for more information. Package 1: nutrition assessment, two 30/minute personal training sessions. Package 2: nutrition assessment, four 30/minute personal training sessions. Package 3: nutrition assessment, a recommended menu, six 30/minute personal training sessions. Contact Colleen Gutowski, Cgutowski@cyedc.org, 484-479-3403 at the Ridley YMCA for more information.